When Peter Bauer was in middle school, his brother built a darkroom in the family’s basement. This was the start of his life-long fascination with photography. He found a compelling, personal reward in attempting to capture something beautiful, then working with chemistry to bring the image to fruition. But, spending hours in the darkroom became impossible when working full-time and raising a family, but that didn’t stop his interest in photography. His next medium was Kodachrome resulting in many boxes of slides jumbled in storage boxes. In 2003 he purchased his first digital camera. He was hooked once again. His subjects have always been nature and outdoors scenes. But during a trip to Argentina in 2012 when he visited Laguna Nimez, a bird refuge in El Calafate, his interests switched from scenic to wildlife, primarily birds. He purchased a “bird lens’, a Canon 400mm f4 DO, and struggled to get sharp pictures with the narrow range of focus necessary to capture birds in the wild. Then he took a five-day photography workshop with Paul Bannick, a well-known photographer, lecturer, and author of Owl: A Year in the Lives of North American Owls. With good instruction, he was ready to get at it. Since 2013, Peter has taken thousands of pictures of birds, as well as a smaller number of other animals including seals, lizards, deer, elk, and Costa Rican rodents agouti and coti, not to mention iguanas, otters, and squirrels. But birds are a particularly favorite subject matter for him. He moves quietly in the early morning when the light is beautiful and finds a quiet place to sit with his long lens, often on a tripod. He lets the birds come to him. He aims to capture something “alive” that will grab the viewer and connect people to the beauty of nature. He believes that documenting the elegance, wildness and beauty of the bird may help promote better stewardship of the planet. He aims to photograph every colorful bird of North America. 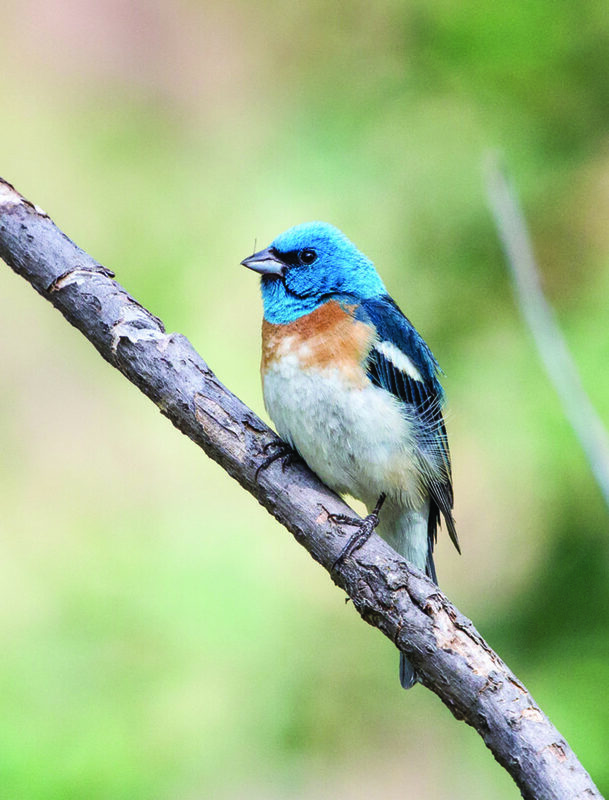 You can see Peter’s photographs of birds at the Winthrop Gallery where he is one of the gallery’s newest members. You can also read his blog to learn more about his interest in photographing birds and his process in general at www.bauwa.wordpress.com. You might find particular interest in his entry titled “American Safari #6”. LOCATION: The Winthrop Gallery, 237 Riverside in downtown Winthrop. HOURS: Open every day, 10am to 5pm. INFO: 509-996-3925, www.winthropgallery.com.